One of the Kompakt label’s more recent success stories, the duo of Saschienne (Sascha Funke and Julienne Dessagne) are disarmingly friendly and outgoing – interacting with each other on stage and in conversation with a familiarity and comfort befitting of a married couple. Unknown , their debut album as Saschienne, is also a decidedly intimate affair. Whether it’s the antique feel of the acoustic instruments, Julienne and Sascha’s delicate vocals, or the beats that creep smokily into each track, Unknown is a capital-A Album, a complete encapsulation of a time and place. 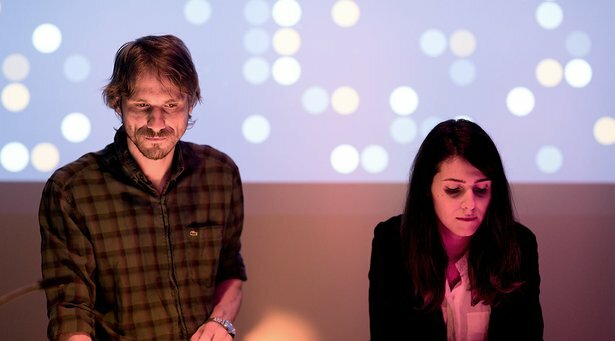 As part of our series featuring artists from the Kompakt cosmos we sat down with Sascha and Julienne to discuss coming together personally and professionally, the making of Unknown , and the challenges of bringing their music to the stage. Let’s start at the beginning – how did you two meet? Sascha Funke: We met four years ago when Julienne was working in a club in London. Then Julienne moved to Berlin in May 2010 and we were setting up the whole music project in October 2010. From that first moment we were playing music together, we weren’t doing anything else - we were really surprised about ourselves, about the way we can work together and also the fact that we don't have the same roots. It came to a point to say "let's do music for more than us and let's do an album". We came very quick to the point to do that. Julienne Dessagne: Probably a bit too fast. And Julienne, your music background is more in classical instruments? Julienne: Yes and no, I mean my background is that actually I like many, many different kinds of music, so I can't say I'm this or that type of music. I listen to a lot of different things and I had a club background, of course. I used to work for Soma in Glasgow, and I used to work for Fabric in London. Yeah, I had this club background and I was a big fan of Kompakt actually from the early days. My training was more classical academic piano, a little bit more boring, but then I listened to contemporary music a lot - Philip Glass is a favorite, and this is a common point for our music. So for me I don't separate genres, it's just music. Sascha, you've released a number of techno and house records. Did you also come from an acoustic instrument background, or did you really start with electronics? Sascha: When I was a child I was listening a lot to pop music in the 80s. I started listening to electronic music in 1992. I never really forgot that other music existed, but I was never practicing anything beyond synthesizer or sampler or other equipment that we know from techno. And how did you first become acquainted with the Kompakt label? Sascha: Whenever the Kompakt DJs were playing in Berlin, I went to see them. I got in touch first with Michael Mayer, Tobias Thomas and Superpitcher. In 1999 I gave a demo CD to the label and, luckily, they picked a few tracks to release as my first single. It’s been nearly 15 years since you started with Kompakt. What’s changed between 1999 and 2013? Sascha: The label philosophy is still the same as it was in the beginning. They never changed the approach of finding personal music with a unique character. Also, many employees from the first days of Kompakt are still working at the office. It shows the continuity they have in sharing the same ideas and challenges around the music. The music scene always changed and will change in the future, but the wheels of Kompakt always find their individual path. Julienne, you worked on the business side of the music industry before starting Saschienne. How did you first become acquainted with Kompakt? Julienne: I discovered Kompakt as a teenager and have loved the label since then. They have released a lot of my all-time favorites. A few years later, I met Michael Mayer as he often came to play at Fabric, where I used to work. We had artists coming from all over the world every week, but a set from Michael Mayer was always a highlight for me. At that time I also got the chance to meet and work with some of the office staff. Kompakt has a real dream team working in its office, all passionate about music and really dedicated to what they're doing - this is also what makes the label so special. Listening to Unknown , there's a common atmosphere – it seems to be very much of a place and a time. Was there a particular feeling from that time that you think is expressed on the record? Sascha: Even the cellphone reception wasn't that good. Julienne: We just spent our time making music and drinking wine. Segueing from that, I wonder if you could run me through the typical studio process for Saschienne. Do you both come up with different ideas or are you usually sitting together? Sascha: It’s never like Julienne's doing this, I'm doing this. We maybe have our favorite instruments that we like to use at some point, but the first idea comes from both sides. I think for the album, Julienne had way more first ideas than me. Right now it's changing. Julienne: Yeah, there's no pattern. Maybe in the past, at the time of the album, Sascha was more doing the percussion and all the beats and I had more ideas with melodies. It was one of the first times I was using Live so it was kind of new for me, and then the great thing about this software is it's very intuitive and you get your way around it very quickly, very easily. Then, after a few months, I started doing all the beats and doing the bass and Sascha was doing all the melodies, so there's really not any decision before we start doing something. Can you walk me through the Saschienne live set? Sascha: I push the clips, I select the Scenes. And Julienne is playing the Moog all the time. Julienne: So it's just me on the synthesizer and I have Ableton as well because my sounds, the Moog, goes through the computer because I'm using effects and plug-ins. Sascha: And the way Julienne is using Ableton as a mixer. Every sound has its own channel and effects. Sascha: But technically we have many sounds and at some points we have 15 sounds on my screen, 15 clips playing. That's why I cannot really use this hardware stuff because normally it's limited to eight tracks. Julienne: There's a lot of layers of sound, so we can't... We really tried to make it simple and like a lot of other live acts, just have eight channels, but we didn't manage this. I think now when we look back, at the beginning I was really stressed out by this. I thought, "are we doing something wrong?" Everyone else has this simple thing and our set looks so complicated, but I think it was also what made it special. Sascha: It's definitely a big plus that Julienne is playing live all the time. She's really playing, and if you are alone it's probably impossible to do both – to run the scenes and play properly, so the effect that I'm doing not-so-crazy things with effects and stuff is actually good because the focus is on the Moog and the live aspect is coming from this part.